If you need a lot of professional newsletters, outsourcing can start to add up. But did you also know you can whip up professional-grade newsletters using Google Docs templates? Keeping your customers and followers engaged requires a lot of communication. That includes with email newsletters. People want to know what’s going on with your brand and your company without it feeling like a chore which is why newsletters are awesome. 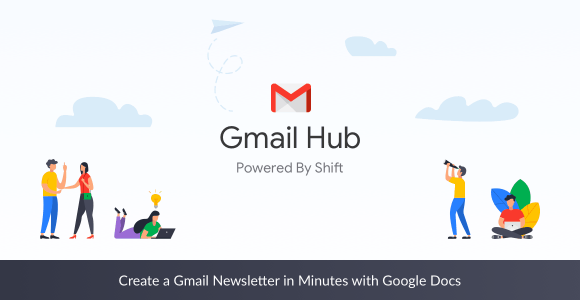 All you need for a great-looking newsletter template is Google Docs. And all you need for seamless transitions between Gmail and Docs is a Shift account. Even with the free Shift Basic account, you can enjoy switching back and forth between your Google services without the log-in hassle. Try Shift Basic for free today! What did we do before Google Docs? I mean, besides spending way too much money on word processor applications. The free templates in Google Docs are pretty much perfect. Not only are there some supplied, but you can also find lots online and make your own, too. Let’s now look at exactly how to kickstart that captivating newsletter of yours. Note: If you want to send the newsletter to a custom group of recipients, check out this guide! Was that too much hopping around between Gmail, Docs, and Drive? Well, it might only be because you aren’t in Shift… Experience Shift’s smooth transitions between Google services and other apps that everyone is talking about!